FROM its rubber estate and tin-mine origins, Puchong has since flourished with new townships emerging in the area. One such township is Bukit Puchong, the first project of property developer Bukit Hitam Development Sdn Bhd (BHD), a member of TAHPS Group Bhd that was founded in 1907. Bukit Puchong covers 1,290 freehold acres, of which about 600 acres have been developed. To date, BHD has built 5,200 residential, 400 commercial and 450 industrial units. Currently, Bukit Puchong has amenities such as a police station, post offices, Tesco Extra hypermarket, Taylor’s International School, and two Chinese schools, namely SRJK (C) Sin Ming and SRJK (C) Han Ming. Bukit Puchong is also within a 6km radius of IOI Mall and Setia Walk. Its current population, according to general manager Edward Lee, stands at approximately 25,000. Lee says BHD will further enhance the township by building a new town centre called BP Newtown. It will sit on 40 acres and have a gross development value (GDV) of RM500 million. The area is accessible via the Lebuhraya Damansara-Puchong, Kesas Highway, Maju Expressway and Sungai Besi Highway. The town centre is set to be a commercial hub with a mixture of residential and commercial components. The construction of the new town centre is ongoing and will be completed in four phases. The first two phases, consisting of 124 units of shopoffices, have been completed and are being handed over to their owners this month. Eighty-five percent of the units are taken up, and the developer has set up leasing teams to help owners lease out their units. BHD hopes to get a tenant mix that comprises banks, F&B outlets, pharmacies, specialist clinics, and academic centres such as art, tuition and dance studios. Phases 3 and 4 of Bukit Puchong will comprise residential and commercial units. Phase 3 will have serviced apartments called the Epic Suites and a commercial site, temporarily named Parcel 3. The RM170 million Epic Suites, launched in the middle of this year, sits on 2.3 freehold acres and features 300 units within two 21-storey blocks: Block A is 90% sold while Block B is 30% taken up since its launch in May. Parcel 3, which will be launched in mid-2015, consists of 54 units of shopoffices built on four acres of land and has an estimated GDV of RM150 million. The shopoffices will feature 3-storey intermediate units and 4-storey corner units. The intermediate units will be 22ft by 80ft with a built-up of 5,101 sq ft whereas the corner units will measure 41ft by 80ft with a built-up of 11,181 sq ft. The indicative selling price ranges from RM2.7 million to RM5.5 million. The shopoffices, although having similar built-ups as Phases 1 and 2’s shopoffices, carry a different concept and design. “Our Parcel 3 shop façade will be different from earlier units, with ground floor units enjoying a wide and columnless front entrance with the walkway and car parking grounds on the same level. 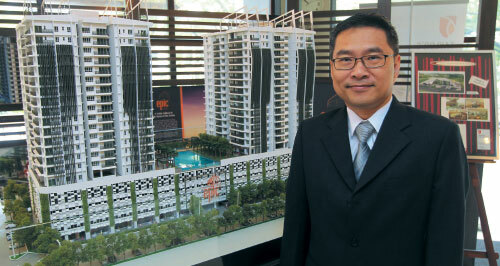 The units will also have huge shop windows,” says Lee. He believes that the architecture of these shopoffices will be an attraction. “We hope to attract more F&B businesses due to the inviting frontage and we believe that these businesses will do well, as well as pharmacies and convenience stores,” he says. The 4-storey units have the advantage of a ceiling height of 20ft, of which Lee says, “We intentionally designed it higher so that owners can add mezzanine floors to the units.” He also mentions that the corner units will be equipped with lifts and will cater well to banks. Lee says that the company will keep 10% of its commercial development for recurring income, and will appoint two to three agents to assist owners with leasing out their units. For Phase 4, BHD is planning another integrated development, temporarily called Parcel 4, to be launched by end of 2015. It will sit on 12 acres and command a GDV of RM1 billion. It will comprise residential and commercial components, which include serviced apartments, SoHo units, retail units and shopoffices. The serviced apartments will consist of 300 units with built-ups ranging from 900 sq ft to 1,200 sq ft. The prices for the apartment units are estimated at RM550 psf onwards. There will be 736 SoHo units with built-ups ranging from 450 sq ft to 800 sq ft. These SoHos will be priced from RM550 psf. For the commercial component, there will be 204 retail units, priced from RM600 psf. The details of the built-up are still in the planning stages. No details of the shopoffices are available presently. According to Lee, the SoHo and serviced apartments are housed in separate buildings. With better finishes and improved designs, Lee adds that the serviced apartments will target a slightly higher market than that of Epic Suites, while the SoHo units will be for young professionals. According to Chen King Hoaw of LandServe Sdn Bhd, this part of Puchong may be rather quiet, and while shopoffices are still in reasonably good demand, location and accessibility will play important roles in future. He adds that investors may shy away from SoHo developments as banks are currently not keen on giving out loans. “It is really a question of timing and how soon demand can return as well as what the prices are,” says Chen. Lee remains optimistic and says that “demand is always there”. Having been in the business for 19 years, BHD has a unique strategy in developing a township by focusing on commercial development before residential. “We believe that factories can bring in business and economic activities which in turn will increase the population,” says Lee. The company also focuses on its existing portfolio of clients by holding exclusive previews for them before launching its projects to the public. Based on the company’s customer analysis reports, 30% to 40% of its clients are repeat buyers and, according to Lee, “our customers are our best ambassadors as they recommend our projects to their friends and families”. “We have zero gearing, we don’t borrow and we have a lot of cash in hand. Therefore, our customers are very confident in us,” says Lee. Some of BHD’s completed developments include 38 Business Park, Baiduri Courts, Park Villa, Ametis Terraces, Nilam Puri Condo, Seri Gemilang and Nilam Terraces, all of which are within the Bukit Puchong township. Another ongoing development is Foreston, which comprises 46 units of bungalows and semi-detached houses. This article first appeared in City & Country, The Edge Malaysia Weekly, on October 13-19, 2014.